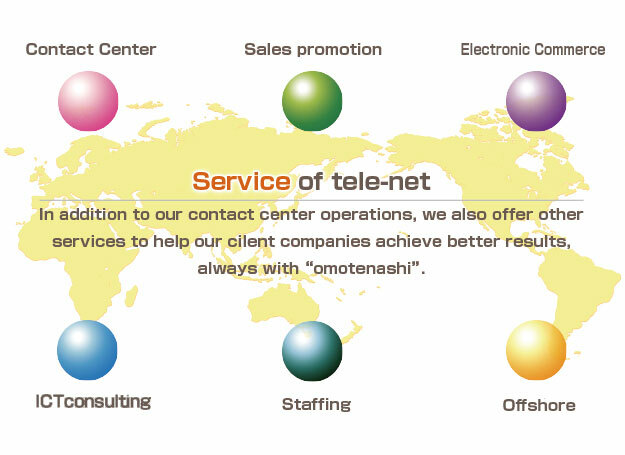 Since our founding in Japan in 1994, our business has grown around our contact center operations. We do more than just handle order-taking and inquiries on behalf of our clients by providing better individual communication through our services and customer contact operations which support our clients and the relationships with their customers. Through our continued pursuit of reliable service quality, we take delight in helping our clients gain the trust of their customers, enhance their corporate value, and achieve better results. In addition to our contact center services, upon request we can also provide a variety of related services including quality IT solutions and efficient, inexpensive BPO services. By establishing locations in Asia and the West, we hope to provide our services to a greater number of companies across a broad area. Please feel free to contact us to find out more about our services.